This was the card I was most proud of for my Artisan submissions. It has a more artsy look to it and is a lot of fun. I started off by cutting a piece of Bashful Blue card stock 5-1/2” x 8-1/2” and score it at 4-1/4”. Next I cut a piece of Whisper White card stock 3-3/4” x 5”. I used my Watercolor Stamping Technique with Bashful Blue, Elegant Eggplant and Pink Pirouette Reinker for the flowers then Lucky Limeade and Daffodil Delight reinkers for the leaves. I adhered this layer onto a 3-7/8” x 5-1/8” piece of Elegant Eggplant card stock. This panel was adhered onto the card front. I wrapped a piece of Basic Black 3/8” Taffeta Ribbon around the card front and tied it into a bow. 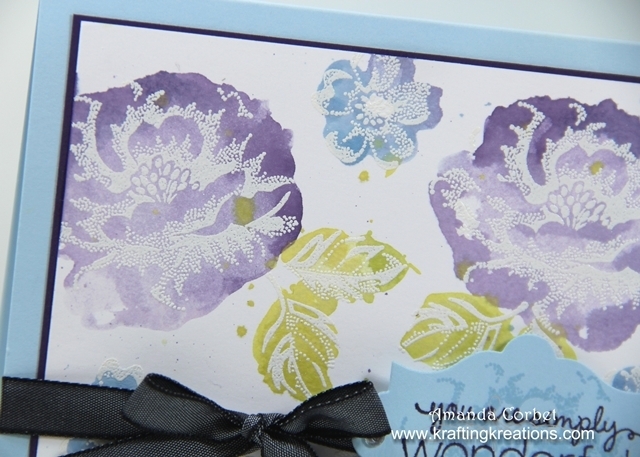 For the greeting label I stamped the detailed rose image onto a scrap of Bashful Blue card stock in Bashful Blue ink. I stamped the greeting from Friendly Phrases on top of the rose with Elegant Eggplant ink. I cut out the greeting in the Big Shot with my Apothecary Accents Framelits, added two medium Rhinestones onto each side of the label, then adhered the label onto the card front with Stampin’ Dimensionals. I just really love the artistic splashed look that you get with this technique! It makes the card look more like a painting then just ink and card stock.